There are a lot of perks to winning the Super Bowl. You get expanded coverage on all the major sports television networks, you get to meet the President, and you get to host the football circus that is NFL Kickoff; the first regular season game of the year. That is what is on deck for the defending world champion Seattle Seahawks as they host the Green Bay Packers in NFL Kickoff 2014. The Packers lead the all-time series with the Seahawks 10-6 but the last matchup between these teams was by far the most memorable. Seahawks wide receiver Golden Tate “caught” a 24-yard Hail Mary pass from Russell Wilson and the Seahawks defeated the Packers 14-12. The controversial ending ended the referee holdout and the difference that one game made in the final 2012 standings had a potential impact in the playoffs as the Packers eventually lost to the San Francisco 49ers at Candlestick Park in a game that could have instead been played at Lambeau Field had the Packers defeated the Seahawks. With the entire city of Seattle watching, emotions will be high as the 2013 Super Bowl championship team will be honored before the game. After that it is all business. Here is what I will be focusing on this week. The Green Bay offense versus the Seahawks defense will be the primary intriguing matchup this week but I am very interested in how the Seahawks offense plays against a talented Packers defense that to me has question marks. I believe the Seahawks will give the Packers a heavy dose of running back Marshawn Lynch early in the game in order to establish the running game, the tempo of the game, and to chew some time off the clock while trying to come up with points. Lynch will have a big impact in this ballgame and he will no doubt get the grand majority of the total carries. The passing game intrigues me with this matchup against the Packers for two big reasons. First, this is the first time since the Super Bowl that we go into a game with Percy Harvin in the offensive game plan. Harvin will not be used as just a wide receiver but as an “offensive weapon.” Do not be surprised to see Harvin lined up all over the field including out wide, in the slot, and even in the backfield. Secondly, I want to see Russell Wilson challenge the Packers secondary, specifically rookie safety Ha Ha Clinton-Dix. Clinton-Dix may not start but he will see playing time whether he starts or not. In games against New Orleans and San Francisco last season, Wilson aired the ball out to challenge rookie safeties Kenny Vaccaro of the Saints and Eric Reid of the 49ers. This week could be no different. If he likes the matchup, do not be surprised to see Wilson go to vertical threats Doug Baldwin and Jermaine Kearse to challenge Clinton-Dix. 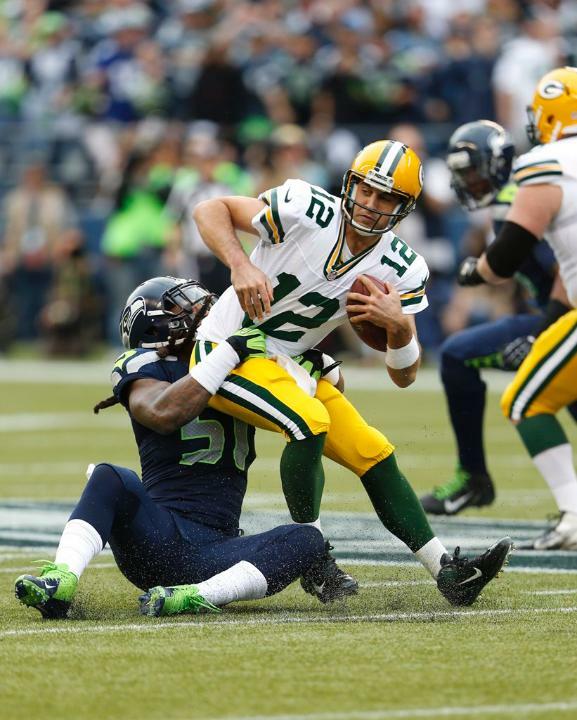 In their last meeting the Seahawks defense sacked Packers quarterback Aaron Rodgers 8 times in the first half. This week it will be just as crucial to pressure Rodgers and force him into sacks and mistakes. The Seahawks will use a pass rush rotation including Cliff Avril, Michael Bennett, Bruce Irvin, and O’Brien Schofield. These four players will need to play a significant role but keep an eye specifically on Bennett. Although he will start at defensive end, I expect Bennett to be lined up as a pass rushing defensive tackle due to the uncertainty of the Green Bay offensive line. The Packers offensive line includes two players who have never played at CenturyLink Field. Left tackle David Bakhtiari has earned the starting job after being an injury fill-in in 2013. Green Bay will also start rookie Corey Linsley at center. Linsley will be my main focus among the Packers offensive line as he will have the difficult challenge of attempting to handle the 12th Man in his first career NFL game as well as handling a fierce interior pass rush. If the Packers cannot show they can protect Rodgers early it may be a long night for the Packers offense. Despite the uncertainty on the line, the Green Bay Packers offense is one of the most talented and dangerous units in the league. The offense plays a very large part in why many experts believe the Packers can make a deep playoff run in 2014 and are serious contenders to win Super Bowl XLIX. By now you know the Packers are led by All-Pro quarterback Aaron Rodgers and this year he sports a more balanced attack. In addition to his dangerous downfield weapons Jordy Nelson and Randall Cobb, Rodgers also one of the best up-and-coming running backs in second-year man Eddie Lacy who can be used to run the ball as well as catch passes out of the backfield. All three should see their share of targets but the Packers still have a big mystery to solve on offense. With the departure of tight end Jermichael Finley the Packers seem to have a void at the position. According to the Packers official depth chart, the starting tight end is listed as rookie Richard Rodgers but my X-Factor player to watch this week is veteran tight end Andrew Quarless. Quarless led all Packers tight ends in receiving with 6 catches, 70 yards, and a touchdown during the preseason. I believe he will be a more relied on target than Rodgers, especially deep in Seattle territory. If Green Bay can move the ball into scoring range, look for the Packers to potentially use a two tight end package with Quarless and Rodgers as well as Nelson and Cobb on the outside. In the 9 NFL Kickoff games hosted by the defending Super Bowl champion, only the 2012 New York Giants have lost in front of their hometown fans. Hosting the first game of the NFL season provides an interesting emotional challenge. During pregame, the team is introduced in front of the entire country watching on television and shortly afterwards, the world championship banner is unveiled to a stirring emotional roar from the crowd. Almost immediately following these special festivities however, it is time to shift the mind to play a football game. Against a quality opponent such as the Green Bay Packers and with no prior experience playing in this game, I wonder if the Seahawks will be able to handle all of the pregame distractions adequately in order to win the football game. It would not surprise me to see the Seahawks get off to a slow start but then pick up the pace later in the game; I mean it is week 1 after all. If the Seahawks can show they can put the pregame emotions behind them and score quickly we will be in very good shape for the rest of the game. Random Thoughts: The Seahawks will wear blue jerseys and blue pants this week with the Packers wearing white jerseys and yellow pants… Al Michaels and Cris Collinsworth have the call for NBC this week with Michele Tafoya patrolling the sidelines. In addition, the entire “Football Night in America” crew will be in Seattle this week for pregame and halftime coverage. That will be neat… This may have deserved its own little paragraph because I feel it is of great importance but here it goes. If you are attending the game PLEASE skip the Pharrell Williams/Soundgarden concert. The concert takes place at 4:30pm and immediately following the concert at 5:30pm CenturyLink Field goes live to the nation on NBC to start pregame festivities. I want to see everybody with a ticket in their seats by 5pm to be a part of a truly special series of ceremonies. That and we need everyone ready for the start of the game… If you are attending the game the Seahawks are strongly advising fans to enter the stadium through the southwest gate and touchdown city. All areas north of the stadium are going to be a nightmare due to concert traffic and people who do not have tickets to the game. It may be best just to stay and tailgate south of the stadium to avoid any congestion… Hawks Nest Bar at 12pm on gameday. Be there… I think it would be really cool if instead of unveiling a world championship banner in the rafters, the Seahawks raise a special championship “banner flag” instead of the normal 12th Man flag. That probably won’t happen though as there are now 3 covered banners already hanging in the rafters at CenturyLink… I wonder if the Seahawks will mix alumni day with the Kickoff festivities. Traditionally the Seahawks honor past players at the home opener… The question must be asked: who will raise the 12th Man flag this week? It is confirmed that former head coach Mike Holmgren will be in attendance this week and he is more than a viable option to raise the flag but his potential participation in the tradition has not been confirmed. Traditionally because the home opener is alumni day the Seahawks let a prominent member of the franchise’s past raise the flag. If I got to choose who gets to raise the flag, my vote would go to the two retired members of the 2013 world championship team, wide receiver Sidney Rice and fullback Michael Robinson. How cool would it be to see those guys wearing their Super Bowl rings raise the flag with the presence of the Vince Lombardi trophy? That would be very special. Prediction: I am going to be bold. This game will NOT end in a Hail Mary touchdown. Yep, I went there. Instead I believe this will not be the offensive shootout people may think will happen. The Seahawks defense will do a decent job putting pressure on Aaron Rodgers but Rodgers will still manage to throw for a pair of touchdowns. Russell Wilson will throw a touchdown to Doug Baldwin and Marshawn Lynch will add a touchdown on the ground. The Seahawks will take advantage of Green Bay turnovers and turn them into additional points. The game will be close for the majority of the night, but a couple of late Seattle field goals will doom the Packers. The Seahawks will go to 1-0 and take a couple of days off before preparing for their week 2 game against the San Diego Chargers. Check back late Thursday night/early Friday morning for me Packers/Seahawks review. To everyone attending have a great time. For everyone watching on television, enjoy the game! Go Seahawks! Not very often do you get an opportunity like this, even less often at home. It has been 8 years since the Seahawks played the Carolina Panthers in the 2005 NFC Championship Game and personally I have been waiting for the Seahawks to get back on this national stage ever since. I became a season-ticket holder in 2006 and for all the games I have been to over the past 8 seasons, opportunities like the one presenting itself on Sunday makes having tickets and going to games during the bad years absolutely worth it. In front of a nationally televised audience on FOX, the Seahawks will take on the San Francisco 49ers in the 2013 NFC Championship Game. If the Seahawks lose the season is over, but if the Seahawks win they punch their ticket to New York for Super Bowl XLVIII on February 2nd. 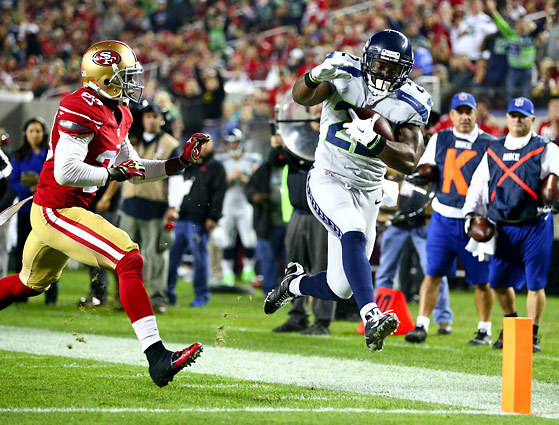 The all-time series between the Seahawks and 49ers is tied 15-15. Their last meeting came on December 8th when San Francisco defeated Seattle 19-17 in the final seconds at Candlestick Park. This is the first meeting between the two teams in the playoffs. There are many storylines that have gained momentum from both a local and a national perspective in the days leading up to this game. Here are my thoughts as we head into the biggest home game in franchise history. The absolute number one key for the Seahawks this week comes on defense. In the last two 49ers/Seahawks games played in Seattle, the Seahawks have held 49ers running back Frank Gore to a total of 44 rushing yards. What I’ve noticed when you dig into all of Colin Kaepernick’s career starts is that he has been successful because of a dynamic rushing attack helping him. When opposing defenses are able to shut the San Francisco running game (especially Gore) down, Kaepernick becomes extremely vulnerable. Once again the number one key for the Seahawks is to stop Gore. Unlike last week where I wanted to see the Seahawks force the New Orleans Saints to run, forcing Colin Kaepernick to throw will help the Seahawks mightily. In Kaepernick’s 28 career starts he has thrown only 11 interceptions. 4 of those interceptions have come in his two starts in Seattle. The Legion of Boom will be Kaepernick’s worst nightmare if the Seahawks run defense allows it to. My target rushing total for Frank Gore this week is between 50-60 yards. If the Seahawks can hold Gore to under 60 yards on the ground, we will be in fantastic shape. The Seattle offense is a unit that has not lit up the stat sheet recently but they have been efficient enough to win football games. There are three things I need to see out of the Seahawks offense this week. The first thing is for Marshawn Lynch to have a productive day at the office. 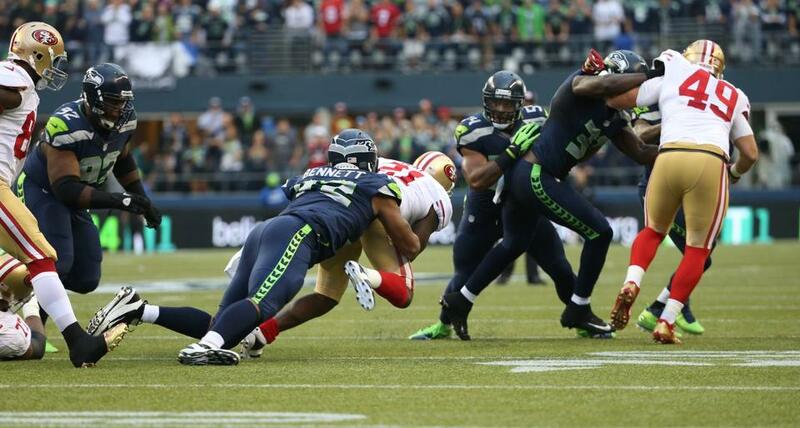 Unlike Frank Gore, Lynch has been very efficient running the ball against the 49ers in Seattle. In the same two game span that Gore has rushed for 44 total yards, Lynch has rushed for 209 total yards and has also added 3 touchdowns. I fully expect the majority of fans to panic if the Seahawks cannot get the running game going early but it will be necessary to be patient through the first half to try to get Lynch large chunks of yards. The second necessity for the Seahawks offense this week is to protect Russell Wilson. Wilson was sacked 3 times last week and he has been sacked 18 times in his last 6 games. 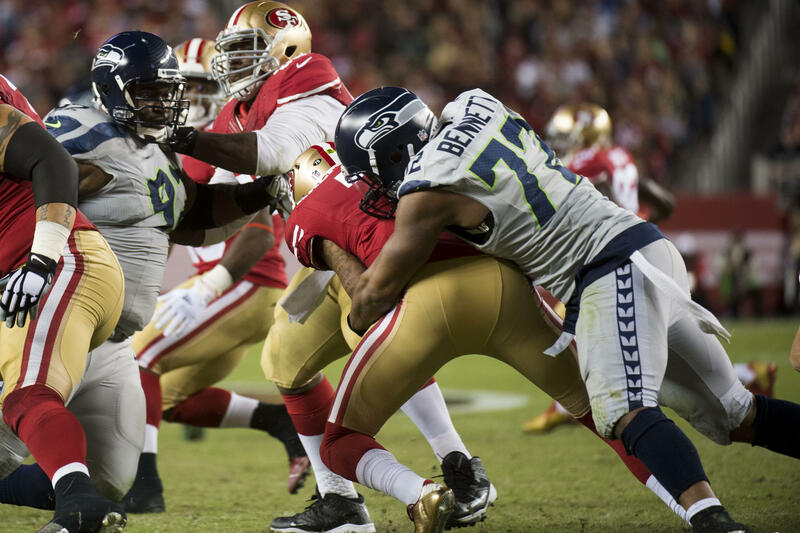 The last time the Seahawks and 49ers played in Seattle, the Seahawks were without two starting offensive lineman and lost Russell Okung to a foot injury early in the game. This week the entire starting offensive line is healthy and I expect significant improvement in pass protection. Keep an eye on the left guard position this week as Michael Bowie is expected to start again after playing a great game last week in his first career start at that position. The third thing I need to see out of the offense this week is an extension of my second offensive key, only the weight of this key falls more on the shoulders of Russell Wilson. 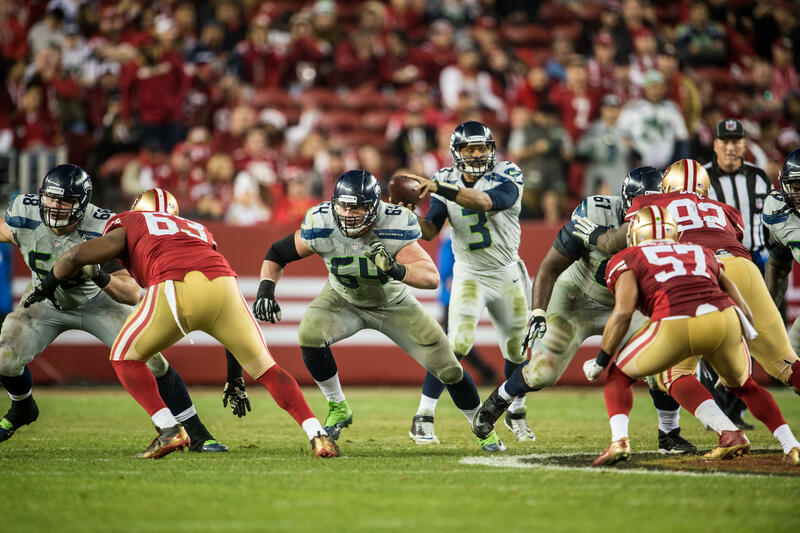 There have been instances throughout the past few games where when Wilson drops back to pass, at times he seems to bail from the pocket and move around to try to make throws while at other times he seems a bit too overconfident being patient in the pocket. In those instances he will wait for a receiver to get open and by the time he decides on his read he is either on the ground sacked or throwing the ball away. Wilson needs to be more aware of what is going on around him to know how much time he has to throw. Confidence in the pocket and connecting on throws down the field will help the Seahawks greatly this week. The San Francisco 49ers come into the NFC Championship Game red-hot and firing on all cylinders. My 49ers preview is rather broad this week as there are only three things that I believe will help the 49ers be more effective this week. The first key is to ride the wave of momentum that comes with an 8-game winning streak. San Francisco comes into the NFC Championship Game as perhaps the more confident team, which comes naturally riding a long winning streak. My other two 49ers keys will be the most important to keep that momentum going. The 49ers need to handle the crowd noise much better than they have in their last two visits to CenturyLink Field. Shorter verbiage and hand signals will be necessary this week and I would not be surprised to see the 49ers use a no-huddle package, especially early in the game. San Francisco will want to take the 12th Man out of the game as early as possible so it will be very important to score early. On offense for San Francisco this week there is only one player that I believe is deserving of my X-Factor player to watch, and that is the most important player that was not on the field the last time the 49ers played in Seattle. Wide receiver Michael Crabtree has elevated the 49ers passing game to extraordinary levels since returning from a torn Achilles on December 1st. Crabtree has averaged 62 receiving yards in 7 games this season and he has also been targeted an average of 8 times per game. It is hard to believe how big of a difference Crabtree has made since returning; the 49ers have not lost since his return. Taking Crabtree away will limit Colin Kaepernick’s weapons to tight end Vernon Davis and wide receiver Anquan Boldin. In my “Making Memories” post earlier this week, I recall the 2005 NFC Championship Game in great detail. One of the things I mentioned is how I never sat down throughout the duration of the game and the 12th Man did not let up on the Carolina offense all game long. I cannot stress the importance of duplicating that stadium environment again this week. At last week’s Divisional playoff game many fans left following Marshawn Lynch’s final touchdown assuming the game was all but over. For a playoff game I find that behavior utterly pathetic. This week cannot and hopefully will not be the same as last week. I hope to spend the majority of the game on my feet regardless of who has the ball. I expect every single fan to scream when San Francisco has the ball. I expect no fan to leave before the fourth quarter clock hits zero. If everything goes right this should be the biggest party in the city. I hope you will not want to leave as the game gets closer to the finish. 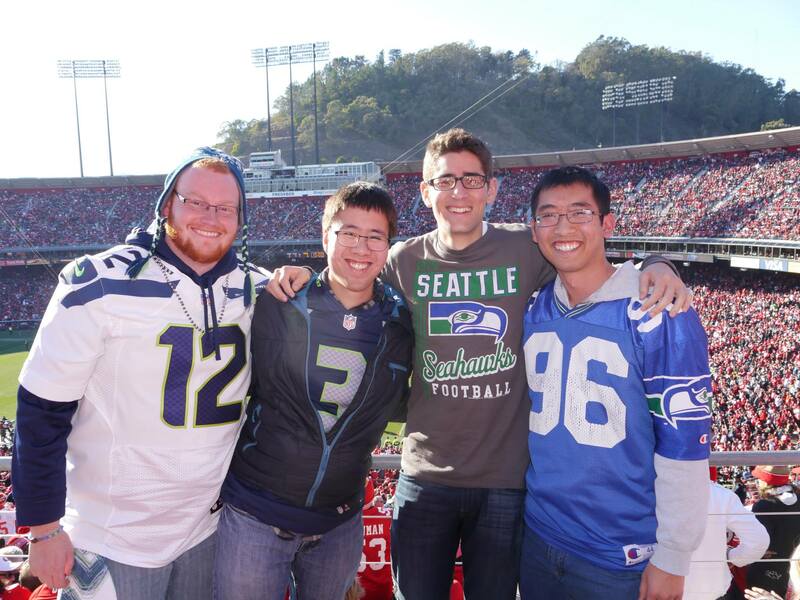 In addition, I want this game to be the loudest Seahawks game I have attended up to this point in my life. We the 12th Man WILL have a voice in deciding the outcome of this game. Do not doubt that. We also owe it to the guys on the field to give it our all. If we stay consistently ear-drum-bursting loud this week, the 49ers will have no chance communicating and coming into our house and stealing a victory. Random Thoughts: The Seahawks will likely wear blue jerseys and blue pants for the final time this season. I say “likely” because should the Seahawks win, they will be designated as the road team in Super Bowl XLVIII. The 49ers will wear their classic white jersey/gold pants look… Gene Steratore is this week’s referee. He called the Seahawks week 8 game against the Rams in St. Louis and Steratore’s crew loosely called that game. He let the players play. Hopefully the same goes this way because if the game is called tight the Seahawks may be in trouble… Joe Buck and Troy Aikman have the call for FOX this week with Pam Oliver and Erin Andrews covering the sidelines. In addition, the entire “FOX NFL Sunday” pregame crew will be attendance this week and they will do their pregame show from inside the stadium, an annual tradition, starting at 3pm… The giveaway this week is white rally towels. All I can say is hallelujah. I’ve been waiting to get the chance to wave a rally towel all season and it is entirely fitting that chance comes in the biggest home game of the season… Ann Wilson from “Heart” will sing the national anthem before the game which actually surprises me because I thought FOX would bring in the most recent American Idol or X-Factor winner to sing it like they have done in the past… The halftime show is one that I am very much looking forward to. Grammy nominated and Seattle recording artists Macklemore and Ryan Lewis will perform at halftime, which turns the NFC Championship Game into a mini Super Bowl in my opinion. Hopefully the Seahawks take control of the game in the first half so I can actually enjoy Mack’s halftime performance… In my opinion there is only one group that I think should have the honor to raise the 12th Man flag this week. Back when we played Tampa Bay in November, the Seahawks honored the 30th anniversary of the first playoff team in franchise history. Members of the 1983 Seahawks stood at the flagpole while Steve Largent did the honors of raising the flag. This week should hold the exact same concept. The only group that I see fit to raise the 12th Man flag this week is members of the 2005 Seahawks led by head coach Mike Holmgren, the first Seahawks team to play in the Super Bowl. I will be extremely disappointed if this does not happen. Even if they do not celebrate the entire team, Coach Holmgren deserves the chance to raise the flag this week… Goal for Sunday: Try to meet up with all of my friends that I know are going to the game… Streamers are a must once again this week. Gotta go all out… If we win, the Halas Trophy presentation will be really awesome to be a part of again… Let this sink in: We are 60 minutes away from playing in the biggest game in Seahawks franchise history. Prediction: There is no doubt that this will be a physical game and it may be close until the final few minutes of the fourth quarter. Zach Miller will catch a first quarter touchdown to make it 7-0 Seahawks. A Steven Hauschka field goal will extend the lead to 10-0 before the 49ers score on a Michael Crabtree touchdown pass in the final two minutes of the half. Halftime score: Seahawks 10, 49ers 7. In the second half the Seahawks will take full control in the running game. Marshawn Lynch will run for a pair of touchdowns, the second of which coming in the final 5 minutes of the game. That will be the dagger. Vernon Davis will catch a garbage time touchdown under the two-minute warning but by then it will be far too late. 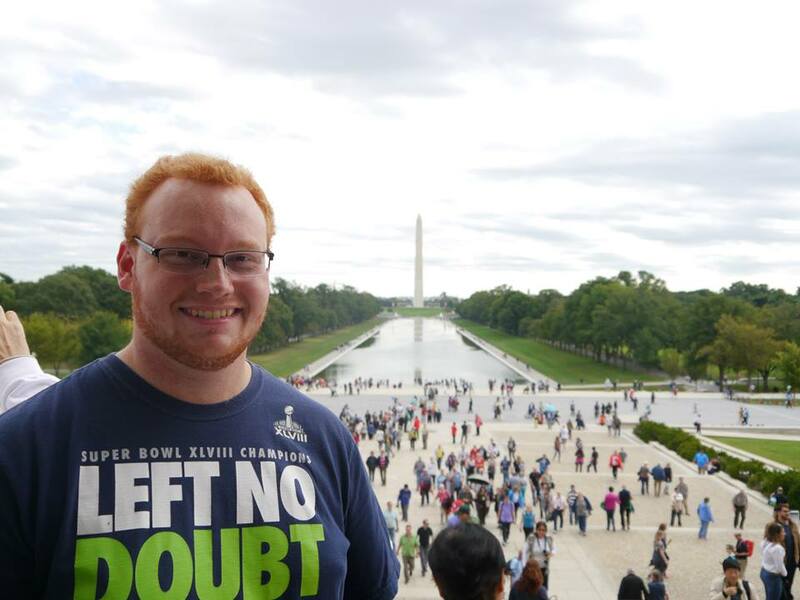 The Seahawks will win, hoist the Halas Trophy, and will head to Super Bowl XLVIII as the 2013 NFC Champions. Whether we win or lose check back late Sunday night for my review of the NFC Championship Game. Whether you are watching on television or at the game, enjoy this one everybody because hopefully this will be a game we all look back on as one of the best in team history. Go Seahawks!